Advantage Auto & Truck Accessories has an incredible inventory of accessories to enhance the look and functionality of your car or truck. Better yet, we install and service everything we sell right here in West Michigan. We also proudly stand behind all product warranties including our installation services. We can cover you bumper to bumper. Call Us Today with any questions at (616) 392-8119. Spray on bedliners provide a rubbery, non-slip, textured surface that grips your cargo for safer transport. Better yet, REFLEX spray-on liner materials can be used to coat car floors, fender wells, protective panels, and many others. Let us help you find the “proper” trailer hitch. We sell and install all types of hitches and we service & repair trailers as well. Advantage sells and installs Tool Boxes, Ladder Racks, Fuel Transfer Tanks, Hitches, Storage Bins, Cab Racks, Bed Slides, and much more. 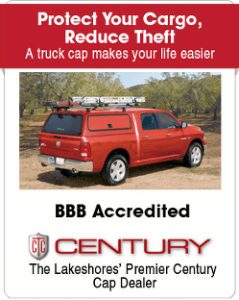 Advantage is West Michigan’s Premier Century Cap Dealer and we install hundreds of Truck Caps and Truck Toppers each year. We have entry level aluminum models, sleek styled fiberglass caps, and even fiberglass tonneau covers to fit your truck. Used Trucks Caps also available! Floor Mats and Cargo Liners help protect your investment and your resale value. Floor Mats or Liners today are designed to keep any spill contained within the liner. Cargo carriers are great when your family or business needs the extra space. Choose a rooftop cargo box, basket, or a rear hitch bike or cargo hauler. Great job, fast install, keep up the good work. Great place and service, got my cap, headliner, slider, bug shield and bed rug. Everything installed in under an hour and a half. Definitely recommended for your truck accessories. Amazing shop! Figured out my car dolly problem. This is after 3 other shops couldn't figure out the problem. Advantage Auto & Truck Accessories has been providing quality products and installations since 2007.